He met his reading goal of 1,000 pages this month–I know, 1,000. First grade is not what it used to be!–so I was going to take him to Lowe’s and Dank Burrito, which was what he had requested if he met said goal. But, today is a new day, and we’re saying yes, yes, yes to this lighting! Demure in the dining room? Never! From the flowers in the sink to the perfect pendant light, this kitchen is positively dreamy. And it’s no surprise, really. Because dreamy, as you can see, is what Bria Hammel Interior Design does. And a fume hood that the kitchen wears around like a jaw-dropping piece of jewelry. And makes even the most industrial of spaces an experience. Speaking of experiences… Have you ever? A reading nook fit for a princess! We think we’d like to curl up in one of these! But not on a sick day. Maybe on a burrito day. After a trip to Lowe’s. Whatever your favorites are, we hope you get to do them all today! Thanks so much for stopping by Design Chic. We love seeing you! My new novel, The Southern Side of Paradise, releases May 7, 2019! While you’re waiting, catch up on the series with this great sale at Barnes & Noble! *B&N is also having an extra 10% off sale, so you can basically get The Secret to Southern Charm for $3.60. Isn’t that nuts? Good morning, chic readers! We hope you’re having a great day! If there’s one thing we know for sure (We’re getting all Oprah on you today!) it’s this: People gather in the kitchen. Open floor plan or closed and no matter where you put the food, a crowd is always going to gather in this favorite homey spot. So we may as well make it beautiful! Check out a few of our favorite tips for styling the kitchen. Add height. Height is just as important in the kitchen as it is on the coffee table or the buffet. Fresh, gorgeous branches are not only long lasting but they also add that organic, outdoor element in the kitchen without the falling petals. 2. Keep it streamlined. We love glass cabinets so much. But it’s important to remember that less is more when styling behind them. This is a great place to incorporate a pop of color if you’re going to. 3. Give the kitchen some jewelry. We’re big fans of brass accents. They’re like accessories for the kitchen! Knobs and pulls are pretty, but pot fillers and gorgeous faucets take it to the next level. 4. A keeping room? Yes, please! Everyone is going to gather in the kitchen. Why not make it comfy? 5. We’re big fans of bar stools, but life is all about mixing it up. Comfy and chic, these benches are the perfect cozy seat. 6. A touch of green is always welcome in the kitchen. Adding a bowl of apples or a fresh green plant is a lovely addition to a white kitchen. 7. Incorporate a touch of color. You know we’re all about a white kitchen. But sometimes a pop of color is nice too. Simple touches, like these pops of blue, add depth and dimension to this stunning space and help bring out the blue of the sea beyond. There’s nothing we love more than a big spread of food and drinks for a big crowd. But kitchen styling can make our kitchen feel like an event every day. What’s your favorite way to style the kitchen? Thanks for making Design Chic a part of your day. We always love seeing you here! If you need a good read for these chilly fall evenings, why not check out my national bestselling The Secret to Southern Charm? As the world spins faster and we get busier and busier in our lives, it is increasingly more important for our homes to become the soothing retreats we need to unwind. There’s no place where that is more important than in the first place you see in the morning and the last place you visit at night: the master bathroom. Whether it’s adding beautiful vanities that look as much like stunning furniture as sinks, or making sure the lighting is just right, the little things can help ensure that this all-important room feels like an oasis. 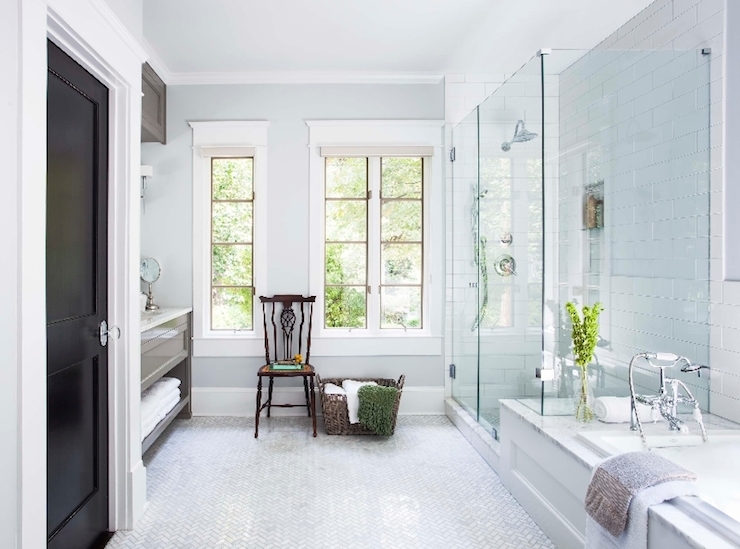 While we can’t create a view, we can make the most of it in our bathrooms, focusing on maximizing light through the windows and situating our baths on the most private ends of our homes. There is nothing quite as relaxing as a steam shower in the privacy of your own master bathroom. This luxury is getting easier and easier to install. Soaking tubs are another easy bathroom staple that can truly make you feel like you’ve had a relaxing spa day in the comfort of your own home. Simple elements from the outdoors can make your bath feel soothing and calmer. Just a few fresh flowers or a simple plant are the perfect addition. Natural materials like stone, marble or granite also lend that organic natural feel to a bath that add to the soothing appeal. If a water view is in your life, that’s just a bonus! We love mixing natural, more expensive materials like marble with less expensive, easy-to-use materials like subway tile. Gray grout adds a custom look. Of course, not every soothing master bathroom retreat needs to look the same. This wooden ceiling adds depth and another layer of organic appeal to this space. What are your favorite elements of a spa-like bathroom? If you’re looking for a perfect Vacation Read, we’d love for you to check out Slightly South of Simple! You know that we think lighting, more than most anything else in a home, has the potential to totally change the look and feel of a space. Nowhere is that more true than the kitchen, where lighting is so important for a functional work space–and where opportunities for accessorizing and really making the space your own are fewer. Or lighting whose color blends in but still makes a fabulous, bold statement, the right pendant can totally transform a kitchen. One of our favorite elements of a kitchen island is the ability to hang pendants over top.But, even if you don’t have an island, pendants are super chic over a dining table. We actually think a pair–or more–of pendants can be an even more beautiful look than a statement chandelier. These pendants combine fabulously with these bar stools to contribute to the overall industrial vibe of this kitchen. Metallics always add a hint of glamour, a touch of sophistication that’s a little less over the top than a chandelier. We absolutely adore the touch of gold inside these bold, white pendants. Speaking of metallics, why try to make the chain blend in when it can absolutely shine! We love how these pendants connect with the fume hood for a totally custom look. What is your favorite style pendant? Do you prefer one that blends in or is made to stand out? Subway Tile in Kitchens, Reese Witherspoon & Nordstrom and More! A big Happy Mother’s Day to all of you moms!